Before you can start booking equipment, you must first define the opening hours for your locations. When you set hours for a location, they will be inherited by all categories, spaces, and items in that location (though can choose to override the hours for specific categories, spaces, and items). 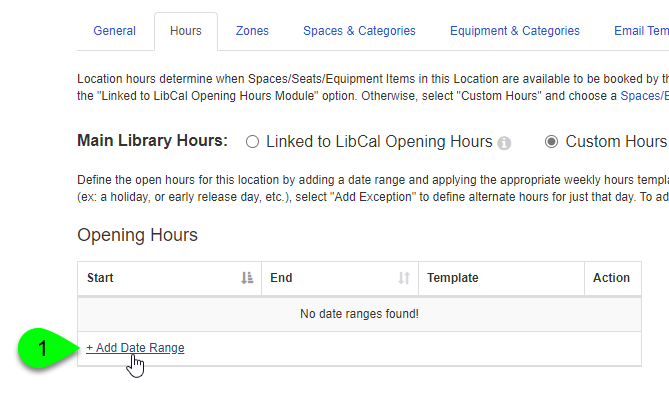 Although you have the option of linking a location's hours to those of a library or department in your LibCal Hours module, you can also set up custom hours to use just for your space/equipment bookings. This can be helpful if your library hours from the Hours Module don't coincide with the times that patrons can book spaces and equipment. For example, if your library is open from 7:30am-1am, but equipment can only be booked between 9am-5pm, you could use custom hours for your location instead of linking to your library's opening hours. Head to Admin > Equipment & Spaces > Manage Locations. If you don't see the Admin menu, you are not an Admin level user in your system. 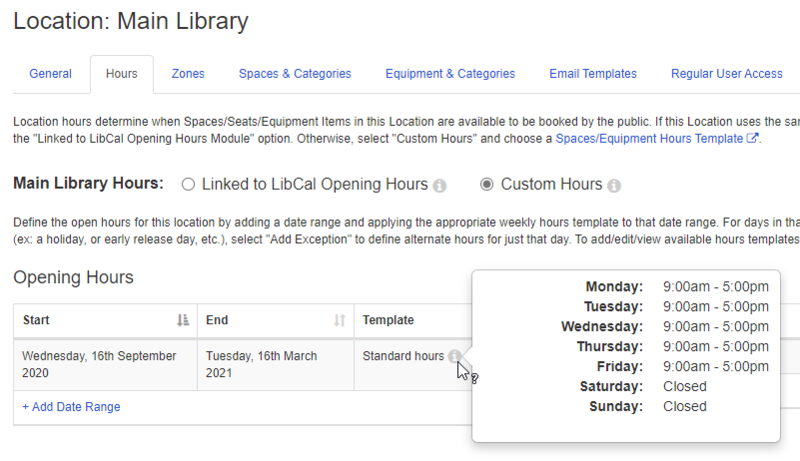 If your library hours from the Hours Module don't coincide with the times that patrons can book spaces and equipment, you can define custom hours instead. Click on the location's Manage Hours link in the Hours column. Click on the Custom Hours radio button. Before you can begin, you must first create your weekly hours templates. These templates define your opening and closing times on each day of the week. To set your location's hours, you will apply these templates to specific date ranges. Under Opening Hours, click on + Add Date Range. Click inside the Date Range field and use the date pickers to select the dates you want to schedule. 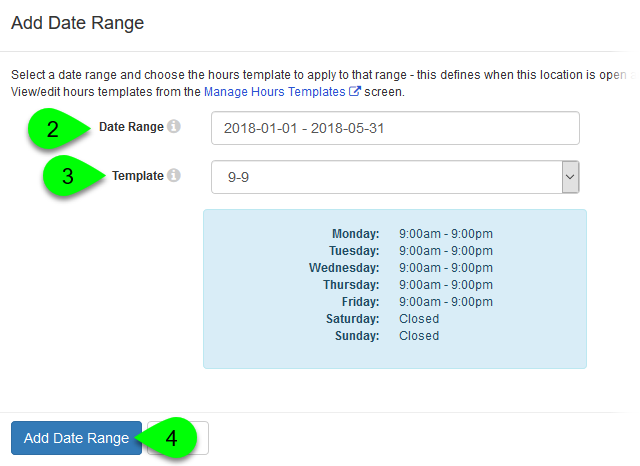 From the Template dropdown, select the weekly hours template you want to apply during the selected date range. A preview of your weekly hours will display below. Click the Add Date Range button to save your changes. Repeat Steps 1-4 to add more date ranges, as far in advance as you'd like. To preview a date range's hours, hover over the Preview () icon next to the template's name. To modify a date range, click on its Edit () icon in the Actions column. To delete a date range, click on its Delete () icon in the Actions column. Note: if a particular date is not included in any of your date ranges, then your location will appear as closed on that date. Exceptions are handy because they allow you to change your usual hours on a specific date, without having to tweak your templates or date ranges. For example, you could have one date range to cover your entire Fall Semester, with individual exceptions for holidays. These also come in handy if you need to set a last-minute closure, too, for things like severe weather. Click inside the Date of Exception field and select the date this exception applies to. From the Exception Type dropdown, select the option that best applies to your exception. Closed: your location will appear as closed on this date. Your location will appear open again on the following date. Open 24 Hours: your location will be open 24 hours on this date only. Your normal hours will resume on the following date. Custom Time: select a different opening and closing time to use on this date only. Your normal hours will resume on the following date. Click the Add New Exception button to save your changes.